FOAB online! The unofficial angry beavers homepage! Good afternoon, last week I fixed up and ran over a good portion of the site, but time is hell, and my FTP program is down. Trying to fix that, and shall throw this much up for now, maybe, say, next weekend, I'll work on the rest. fan art - The old gallery of fan art needs to be fixed up, reposted, with an addition or two still in my email. an interview nick.com did with Stacy and Chelsea Shauer - This was a while back, but thought I could well steal it for myself. movies from the above source - 2 movie clips from If You In-Sisters. Short. fix links - Dead links, new links. I need to find a way to keep links fresh. clean up my emails, add changes from there - A lot of stuff has gathered which i meant to get to, will very soon fix that for you all. character info on secondary characters - By popular demand, info on Treeflower, Barry, Stump, the sisters, Bing, Trucky, etc. message board? - I should find a message board, not that I expect it to be active, but some place to ask questions, get some answers, discuss things. The lost final episode - Upload and speak of (maybe add it to season 4s page) the final TAB episode 'bye bye beavers'; post the mp3 from on Micah Wrights site. First of all FOAB stands for 'Fans Of Angry Beavers'. 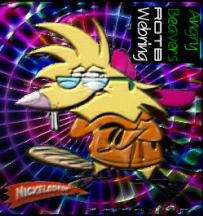 The angry beavers (affectionatly abbreviated to TAB or AB) is a cartoon on Nickelodeon about two furry little beavers named Norbert & Daggett (Norb & Dag) who are kicked out of the family dam when a new litter of beavers are born. Together they build themselves a dam of their own and from here, their misadventures only get zanier. Angry Beavers first aired on Nickelodeon in 1997, at which time I was in grade 5 at school. I think FOAB kicked in moreso in the year afterwards, it was a group of my friends in class starting an inclass fanclub and in July of 98 I decided to create my own fan site online under the club name. I had high expectations for it, and other great websites stood as both competition and inspiration. Sites like Red Frogs Angry Beaver Site, as well as the works of Paul of Spootforce and John T. Its tragic that they removed their sites when their time to maintain them wavered and I'll greatly miss their efforts in TAB fandom, for truly, they towered over me in their brilliance. Season two aired, we were all very excited, I remember taping them for my friends, as I was one of the only kids in the class with cable. Foab was touched upon very lightly over the few years that followed, and schoolwork as well as my own slackness, other interests, and soforth drowned me, FOAB online wasn't given the time it deserved. Sections like sounds and images were never put up. Our beaver brothers reterned for another two series, but Nickelodeons attention in the show was horribly lacking, and I'm not too sure what happened, although rumor has it Nickelodeon sold its soul to satan, who in turn demanded they punish us by pumping out more and more episodes of the Rugrats and Spongebob while cancelling such greats as Rocko's Modern Life, Real Monsters, Hey Arnold, Angry Beavers and Invader ZIM. Yes, TAB, by most accounts, is officially dead. Repeats still occassionally appear, apparently more often over here in Australia than America, but its still a rare find. Wow, is that right? This site hasn't been touched since 2002. Time's gone quickly, my friend. Some pieces are still in my email, awaiting this moment, the next time I touch up the site. So it came to me, (and although i'm not sure how the American schooling system works) that before I finish my final year of highschool, now is the time to put that tiny bit of effort into the site, see if I can finish it off once and for all, and leave it as a towering testiment to beaverdom, and memorial to its greatest. You are not alone in your fandom, and many have made themselves known, sadly, no great place for us to gather online stays too stable, and the fans fall back into the woodwork. So what was my point? Oh yes, heres to Norb and Dag, those angry, angry beavers we loved so much. Cheers. 26/4/2004: How many years now have I spent saying "this week I plan to fix this site up once and for all, finish it off. complete, rather than patchy as it's stood for its six years of existance. FOAB shall be completed, you'll see. Hopefully soon. FOAB has a banner! Click on it to find out how to put it on your site! And a big thanks to you for visiting FOAB online: The unofficial angry beavers home page! Although I have every intention of finishing this site up, I'm still open to comments, and would appreciate both new links, and to be informed of broken outdated links. Please include an obvious subject line such as 'Angry Beavers', as those with 'none' or 'hi' are lost in the vast abyss I call my junkmail filter. Forgive me if it takes an age for me to change anything though. Email. Support of the site, such as adding the FOAB banner to your site is also appreciated. inform me if you intend to use information from here on your own site, although pictures and sounds are alright, as I've taken them myself from elsewhere. NICKELODEON, The Angry Beavers, and all related titles, logos and characters are trademarks of Viacom International, Inc.
Would you like to join the ]|[Realm Of the Beavers]|[ ?